Produce your own static clings! *Additional programs or changes are available for an additional charge. Option 1: GENERIC/BLANK LABEL- This option is the fastest delivery time for your new system. 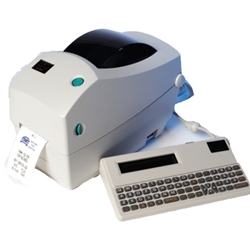 If you are using a generic label the machine can be programmed to print your name and phone number on each label. If you are using a blank label your name, address and phone number can be programmed. Option 2: CUSTOM MULTI-SITE LABEL- This option is a custom label that can be used for multiple locations. Each store's printer can be programmed with a different phone number or location. Minimum order of 5 rolls. Option 3: FULL/CUSTOM LABEL- This option is a custom label that can be used for 1 location that may include their name, address, phone number and logo. Minimum order of 5 rolls.